Congratulations, and welcome to the realm of the gods. Your courage and intelligence have led you to us. But this is just the beginning. Always in search of entertainment to stave off boredom, the gods are hosting a grand tournament in which heroes compete to become a demigod! To attain this ultimate reward, heroes must master magic dice while facing glorious ordeals on celestial islands and making offerings at the divine temple. All that remains is to find a few capable heroes to put on a good show. 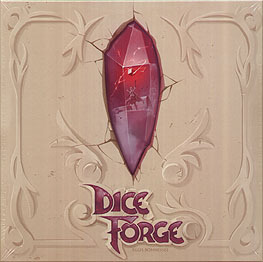 In Dice Forge each hero receives two dice with removable faces that they can modify and upgrade over the course of the game. Through this customization process, heroes channel the random power of dice to take control of their fate! With each roll, heroes collect resources and open up a host of possibilities. They become more powerful by purchasing new faces to upgrade their dice. To win additional rewards and glory, they must also face ordeals devised by the gods. Heroes' divine dice are their most precious allies in their quest for a place in the pantheon. Heroes - stand ready to control the luck of the dice and earn your place among the gods!